The Cognitive-Communication Checklist for Acquired Brain injury (CCCABI) is a 1 page referral tool summarizing 45 communication difficulties in 10 areas of cognitive-communication functioning. It was developed by Sheila MacDonald and is based on evidence synthesis, pilot testing, and expert review. The Cognitive-Communication Checklist for Acquired Brain Injury CCCABI was developed to assist individuals with brain injuries access speech-language pathology services. Communication impairments are common after brain injury with incidence rates higher than 75%. Most often these are cognitive-communication deficits which result from underlying cognitive or thinking difficulties (e.g. attention, memory, reasoning). After a brain injury, communication difficulties can be debilitating and difficult to identify and to describe. Speech-language pathologists are experts in communication intervention. 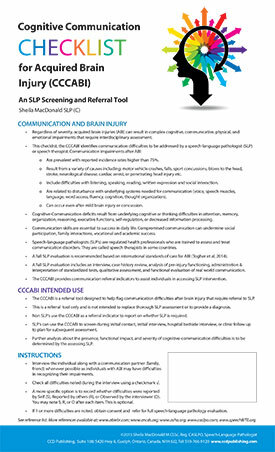 The CCCABI is a referral tool designed to help identify communication difficulties that require referral to a speech-language pathologist (speech therapist). To help people with brain injuries and their families describe their communication difficulties. To help healthcare professionals detect communication difficulties more consistently. To help administrators, program leaders, and funding sources to understand the effects of brain injury on a person’s ability to think and communicate. The CCCABI is a referral tool only; it is not intended to replace thorough SLP assessment or to provide a diagnosis. Once difficulties are identified on the CCCABI the individual should be referred to an SLP for a full assessment. Colourful CCCABI checklists can be ordered in print form. Click to order the CCCABI. © 2019 CCD Publishing. All rights Reserved.